Why do I need to have my fire extinguisher certified annually? To ensure that it will function properly when needed. Why do I need to have my fire extinguisher hydrotested? Hydrostatic testing assures the integrity of the cylinder before returning the cylinder to service. Test intervals vary with the type and location of the extinguisher. For most applications a 5 lb Dry Chemical ABC extinguisher with rating of 2A;10B,C or greater. However; depending on the application, larger size or different extinguishing agent may be required. This is dependent on the size and layout of the location and what types of hazards are on the premises. What is the difference between an Annual Maintenance and a 6 Year Overhaul? A six year overhaul includes in addition to all annual maintenance items, an internal inspection of the fire extinguisher cylinder. This requires depressurization of the fire extinguisher and removal of the extinguishing agent. In most cases the extinguishing agent does not need to be replaced and can be reused after the cylinder has passed the internal inspection. The seals of the fire extinguisher (cylinder neck seal and valve mechanism seal) are also inspected as part of the six year overhaul and usually replaced per manufacturer procedures. I tested the fire extinguisher to see if it works and the pressure gauge is now in the red, what should I do? After a Dry Chemical Fire Extinguisher is activated (even briefly) the extinguishing agent prevents the valve stem from sealing completely and the remaining pressure charge will escape. This renders the fire extinguisher inoperable and in need of service. 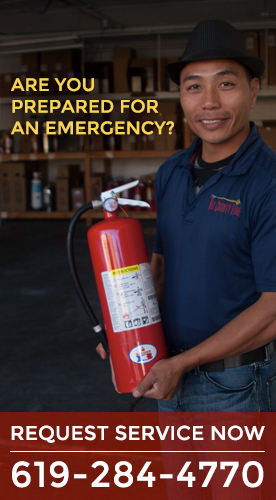 You should have the extinguisher serviced by your fire extinguisher service company. Do I need to have my fire extinguishers serviced more than once a year? Not as long as they are in working order. The law states that they only need to be serviced annually by a licensed concern. You must however check them yourself on a monthly basis. Does my fire extinguisher need to be mounted? Yes; all fire extinguishers in service need to be mounted on an approved bracket, unless they are in a cabinet. Can I still have my Halon fire extinguisher certified? Yes; however you can not purchase new Halon fire extinguishers. If you currently have Halon fire extinguishers in service, you can continue to have them certified annually. Replacements for Halon fire extinguishers have been developed, and are available for purchase. Even if my fire extinguishers are inspected annually by a licensed concern do I still need to inspect my extinguishers monthly? A. The pressure indicator on the gauge is in the green. B. The pull pin is in place and sealed by the tamper seal. C. The hose or nozzle are connected and not obstructed. D. Verify the extinguisher is appropriate for the area or hazard. E. Check for any damage to the extinguisher. Another company said that I have to have my fire extinguishers serviced or purchase more equipment to meet code. The law states that fire extinguishers need to be maintained annually by a licensed concern. If you are unsure if you need additional service or equipment please, contact us at (619) 284-4770 and we will be happy to assist you. I own a restaurant and currently have fire extinguishers. I have been told that I need a K class fire extinguisher is that correct? Most restaurants and mobile kitchens need to have a K Class Fire Extinguisher. 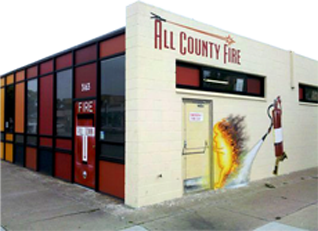 Consult your Fire Marshall or agency having jurisdiction over your enterprise. Does my fire alarm system need to be inspected annually? Yes; fire alarms need to be inspected annually. Does my locked fire extinguisher cabinet need to have a hammer or mechanical device to break the glass/acrylic front? Yes, unless it has a door that can be pulled open. All fire extinguisher cabinets need to be either unlocked or have a way of accessing the fire extinguisher without using an unprotected hand to break the front panel in order to gain access to the fire extinguisher. Can I still have my pressurized water extinguishers certified annually? Yes; however they are not rated for class B (Flammable Liquids) or C (Energized Electrical) fires. How can I recycle/dispose of my old unwanted fire extinguishers? We will recycle all of your unwanted fire extinguishers. Or you can contact your local regulatory agency for locations and instructions. Please call our office before bringing in large quantities of extinguishers to recycle.